Raizil rubbed the sleep fro her eyes, and then took on a serious face as she answered his question. " Since you asked me straight up, i will let ou know. Jake was to weak to be my mate. He would not have been able to lead the clan as the mate of an alpha, he just didnt havent in him. I need somebody who will stand with me as my equal, that when i have pups they will be strong. Sometimes Samuel you just have to listen to the wolf part of you more than the human part. So that is why I did that. If Jake is seen back on our land, find out where he has taken Kenji then kill him, you dont attack an alpha and get away with it. Moonlust or not, plus I want no disloyal members in this clan." Samuel listened carefully to the girl. Maybe she had a pont, though he still thought of her actions as stupid decision. When he heard her last rders his eyebrows raised a little. He didn't expect that from her. It seemed like she wasn't that soft. ''Weak or not, you still love him. But as your beta I will do whatever you order." he said and lowered his head a little. He made a grimase which remained unseen by the alpha female. He still felt unpleasant every time he had to follow her orders. Sam turned around and approached the exit of the leader's den. But before leaving the room he mentioned one last thing. "It's time to ask Nyx what to do next, Razil." After his last word the man left the place. Raizil knew that Samuel was right. She thought about who she would be able to lead a clan with, and maybe evenually come to love. She did still love Jake but for the clans sake and hers she needed an alpha male to help rule. She thought maybe Samuel, but she always got the feeling that he didnt like her one bit. She wondered what she did to him to make him not like her. But she would have to figure that out later, because right now she needed some advice from the goddess herself. Raizil slowly got up and carefully made her way out her den and down the ladder. She headed off in the direction of Moon Garden. Samuel was sitting on a chair in his den when he secretly peeked out of the whole, which looked like window. He saw Raizil leaving the dens. She was moving gracefully like she was flying. Sam swallowed noisily, not being able to stop looking at the wolf girl. Suddenly he closed his eyes and clenched his teeth. ''Stupid wolf girl.'' he murmered to himself. There was something in that woman that could drive him mad;make him bow and do whatever she desired, but Sam would never really admit it nor let it take over him. It was true that thewolf inside him had needs, but Sam would never forget that he is half human too. The young man sighed and got off his place. His hand clenched into fist as he tooka deep breath. He needed to clear his mind. Besides he liked being alone, away from his annoying new clan mates. Julian sat outside the house, guarding it. Raizil and Samuel had run off. He had heard their conversation. Infiltration of minds was his specialty. However the buzzing in his head had become unbearable. He held his head in his hand, his breath short and raspy. His elbows were propped up on his knees, and he set in an odd cube. His bangs hung like a curtain around his face, disguising the few stray hairs that clung to the sweat covering his face. He had shifted after attempting the eavesdropping. His limbs felt weak, and his body was visibly shaking. He squeezed his red eyes tightly. White dots danced in front of his eyes. 'C'mon, Julian...' He thought, trying to remember how to stand up, running the muscle movement through his head. He set his hand on the wall behind him, and unbent his knees to stand up correctly. He stared at the ground, tears clouding his vision. He held his forehead with a hand, and carefully walked back to his house. His hand pressing on the wall with most of his weight. His slight stumbles were had to disguise, so Julian did not try to hide his weak body. 'I wonder what Nyx wants...' He thought absentmindedly. As Kari slowly approached the den entrance she saw a male wolf. She watched him guard a few minutes before she decided if she was going to approach him or not. "Should I approach him and tell him or..." Kari muttered under her breath to herself. "Damn it he can see me." Kari muttered under her breath. Before she cam out from behind the bush she altered into her human form. She walked out from behind the bush nervously laughing, hoping she wouldn't get killed or something. "Uh, uh." Kari stuttered. "There is a really angry vampire and she is like about to rampage and I just wanted to bring that to your clan's attention." Kari stepped out more from behind the bush attempting to approach Julian closer, since she now felt more comfortable being near him. She thought he seemed pretty friendly so far. Julian frowned, the creases in his forehead growing even deeper. "A vampire rampaging on our..." He had begun to run his fingers into his hair, trying to dry the sweat gathering on his forehead, but he stopped staring at her with a widened eye. "I...Who are you? And why are you-" The werewolf paused. Then he closed his eyes and groaned. "I don't have time for this." He said with a sigh. He straightened up, some force coming back into his limbs. He shifted, quickly jumping into the shade to hide from the small slivers of sunlight. He turned around to the girl. "You coming or not?" He said in a gruff and brusque tone. His black ears twitched. When she hesitated, he shrugged. "Alright, have fun with the clan camp." Then he bounded off, hoping to find Raizil soon. Kari watched as the other werewolf scampered off. At first she hesitated to come with him, since she was still cautious. "Damn it. I should have followed him." Kari muttered to herself. She sighed. 'Im just gonna go explore this den thing....' the thought to herself as she entered the den. But she soon got bored exploring around so she morphed into her wolf form and ventured around the territory, sneaking past guards, and eventually found herself a village. Samuel arrived pretty quick. He held Raizil gently while walking over the old fallen trees. At times he glanced at the girl's face studying her features. They were beautiful, so was she. Rai looked like a little doll in his hand and he was extremely carefull in order not to brake her. She seemed so calm sleeping in his hands, like an angel. However, realising the fact that a smile had appeared on his face due to those thoughts, the alpha male quickly shook his head and once again his face became dark and emotionless. Sam entered the den of the alpha leader, which Rai and he had to share. He placed the wolfgirl on her bed, making sure not to wake her or her son up. When the youth was done he left the den. Sam looked around for a second before taking a seat on one of the thick branches near his new home. He took a deep breath and unfrtunatelly caught the scent of a wolf who did not belong to their clan. A frown appeared on his face but he decided not to follow and create more troubles to Raizil. He was just going to ask some of his clanmates later when things cooled down. Raizil woke up about 30 minutes later. She took her son to his roomas and laid him down carefully in his own bed. With a yawn she wondered through the house as she follow Samuels scent. She found him sitting out on a branch. "Sam come lay down please. I um know we dont know much about each other but i could really use a comfort right now. I watched as Jake died then had to bury him. Please just for tonight, i need you with me." Her voice wasnt that of an alpha it was of a woman who needed her mate by her side to reassure her. For once her voice was soft and filled with emotion. Her short white hair blew in the wind, her ruby colored eyes were illuminated in the moonlight, Rai looked small and fragile. It just goes to show what a day this has been for her. Sam was sitting on the branch quetly, making sure he won't wake up Raizil or Kenji. His back was leaned against the thick tree bark as his eyes wandered around the dens. It was quiet, maybe because most of the wolves were out, enjoying the night. He used to do the same when he was young. But things changed the moment he took over his clan. Back then he had to stop acting like a child and become the serious man he is now. While enjoying the silence, Sam though about his new rank and mate. Even though he was once again a leader he still felt strange and he knew it was all because of that mate thing. It was true that he did not like Rai so much in the begining but things definitely changed as time passed. His cold and unfriendly attitude towards her, however, did not change only because he did not want to admit he liked her. Suddenly a female voice made him tilt his head left and look at the girl who called his name. It was Raizil. She was standing there, looking so fragile and small. There was sadness in her eyes as well as pain. It would be a lie if he said he understood her, but he could atleast try to comfort her. At her request he answered with a slight nod and quickly got off the branch. With slow steps they both entered the den and soon enough laid down in their soft bed. Samuel placed his left hand under his head as he wrapped his right one around Raizil. Despite the gentle move, the wolf king did not dare looking into her eyes. Raizil sighed in relief when she felt Sams arms wrap around her. She turned towards jim so that her head was facing his muscular chest. "Im sorry if i have caused you any troubles today. I try and be a better alpha. But truth is i have never ran my own clan before. You seem as though you have some experience, so if you could teach me i would be grate really grateful. Also i have to admit i starting to really like you. You may act touch and cold but im starting to see right through that act Mr. Samuel. " she says making sure they make eye contact, a smirk lit her face. Her face for the moment was carefree and mischievous. Samuel laid on the soft bed still. He tried not to move despite Raizil's trials to get as near as possible to him. His eyes were half closed as he gazed at the ceiling. His chest moved slowly each time he took a breath. The tips of his fingers of the arm, which was carefully wrapped around Raizil, touched her skin gently. He listened to her words before answering to her request. "I will help you, but don't expect me to make miracles." 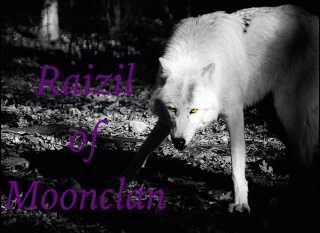 his voice was blunt and cold, something most of the members of Moon Clan were used to, but he doubted Rai liked it. Her next words, however, made him feel really embarrassed, especially after their eyes met. Sam held his breath for a second as he swallowed nosily. He quickly looked away as he clenched his teeth. He sure did not like her comment, maybe because she was right. But letting her know he is somehow interested in her would only cause him more troubles. "You look pretty much carefree for someone who had just lost a loved one." he whispered quietly before his looks once again stopped on the ceiling. He knew these words were harsh and it was possible to have hurted her but this was the only way to get away from this tight situations he suddenly was caught in. Rai giggled when she saw Sam embarrassed faced. If she wasnt mistaking she had never seen him flustered like that. What he said next though wiped that smile of her face so fast it was almost as if it was never there. She pusted away from Sam, how dear he. Rai was trying to forget about everything that happened today. She got up out of bed and then turned to Samuel. "Thank you Samuel for reminding me of the heartache that im going through. It was like i was wanting mu mate to be there to comfort me and take my pain away, or no. Take the bed I'll sleep among the stars tonight, maybe they'll bring me the comfort i seek." Rai said before she left the house and after she was on ground level she shifted and headed off to the moon garden, she needed and wanted the reassurance and comfort of her goddess. Samuel gave an unnoticeable glimpse to Raizil before she left the den. A sigh came out of his lips as he turned his back to the entrance. The man continued lying in the bed and kept his left hand under his head and the right one he rested beside him. His eyes narrowed as an irritated look appeared on his face. He was not proud of his words, nor his cold attitude towards his mate. He didn't want to hurt her, it was part of his nature, which to be honest, he was not planning to give up on. His cold and bitter act was not a replica of something in his past. He was simply not used to those lovey dovey stuff Raizil and almost every women in the world desired for. He thought of it as weakness, which he couldn't show, otherwise he might become somehow soft. Sam couldn't imagine himself as a soft guy. It was against his priorities. However, that was not a good excuse for his attitude. Once again the brown haired youth sighed before closing his eyes. He was planning to apologize to Rai but not now, because he doubted she wanted to see his face after his words. She needed some time on her own, so did he. The thundering sound of the falls remained muffled as the man continued to delve deeper into his book. He frowned and waved his hand away, putting the brown tome back on the shelf. He stood up, the wooden floors of his home creaking. His eyes skimmed over the dusty encasing of his office, and he took off his glasses with a tired sigh. The scent of Raizil and Samuel came quickly to him, but he felt in no hurry to reveal himself. He scratched his head through his shaggy mop of hair. "They can do stuff without me..." He muttered casting away the dust with a flick of his hand and walking into his kitchen. He picked up a clear glass and filled it water, taking a long swig of it. He stood leaning on the counter thoughtfully before dragging himself out of the door. He peered outside, his neck craning upward to see a form disappear in some unknown direction. The wolf felt some empathy for the young alpha female. 'Samuel is rather harsh isn't he?' Despite his thoughts, he did admire his old leader. The foreigners were odd, yes and demoting him to Beta did make him feel sympathetic of the young leader. "But that doesn't change the fact we were still threatened with war." He said with a tired sigh as he leaned against his door. The older wolf rubbed his thumb against his ring finger in an attempt to reassure himself that peace was made. With a brisk wind at his back. He made his way up to the male. As Rai was making her way home she saw Jan near by. She walked over to him with a smile on her face and lighly punched him in the arm. "Hey there old timer." She teased him. She liked to tease Jan because he was such a mellow soul, and a little childish. She didnt really have to be her "alpha" self with him. He blinked, his hazel eyes flickering. 'I'm too worked up...' He thought with an inward sigh. "Well." He said visibly relaxing. "How is Kenji?" He let his hair fall over his eyes, as he hovered over the female. 'She's so small...' He thought, self-consciously as he stared at her crimson eyes. Rai cocked her head to the side at his weird behavior, she could feel him getting worked up. But it soon left so she didnt pay it much mind. At his next question a thoughtful looked crossed her face. "Hmm, would you be willing to watch him and keep him entertained for awhile. I think me and Sam need some time to ourselves, ya know. And this isnt an order so if your busy and have other things to do i understand. " Time had given Julian time to heal, but even with their slowed aging, he still felt the affects of 10 years growing on him. His knees would creak when he crouched, and his neck ached more then usual. He leaned against a tree truck, blankly staring at the falls. The water flowing in an ever changing route, and even 100 years couldn't change that. He blinked thoughtfully as the sounds of nightlife filled his ears placing a frame of peace on the scene. Raizil and Samuel had somehow made an heir. Everyone had congratulated them, but he was still lost on the idea. He had so many questions but when he pursued the subject he was met by odd stares. So he gave up and divulged in the idea of a bird bringing it in a bundle of cloth. Rai walked back to the dens after not catching any prey. Its not that there wasnt any it was more like she wasn't fast enough due to her being pregnant with her 1st pup. Even after 10 years she had yet to let Kenji know that he isnt and never could be the heir to the clan. 'I should ask Sam what to do' she mused to herself. Rai and Sam's relationship started out not so great but after a couple of years he warmed up to her. She spotted Julian and slowly made her way over there. "Hey Julian." Ten years did not change the werewolf much at all. His hair had lengthened and was now tied together with a small purple ribbon. He fingered the silky length of cloth, staring at the moon through the branches of the trees waving around in the wind. His hazel eyes crinkled as he relaxed at the sight. It had been a quiet day, but the young adult had plans to read some more from a new tome he had received as a gift from his favorite bookstore in the Aslad Village. "I can't possibly take this..."
"No please, it was my late wife's— may she rest in peace. She would want you to have it." A deep voice pulled him from his thoughts. "Good evening, Julian." Another voice came from beside him. He glanced over at Raizil and her swelling belly. (Wait how far into the pregnancy has she gone???) "You should rest rather then walk around in the dark, little miss alpha." He said with a small smile, patting her on the head.